Why Did Bill Turn Away from His 401(k) & Mutual Funds? In February 2017 Bill contacted me again, bringing me up to date on what’s happening as he approaches age 70½, when he’ll need to begin taking required minimum distributions (RMDs) from his tax-deferred retirement savings. Bill had only two Bank On Yourself-type dividend-paying whole life insurance policies when he wrote to me the first time. Now he has three! Hi, Pamela. You quoted me in your book. I funded my son’s college education by depleting a mutual fund first and then borrowing from a 401(k) at work. Well, the mutual funds are now all dried up and the 401(k) did not earn as much as it would have if the funds were still in it. I did pay back the 401(k). If I’d had a Bank On Yourself-type policy, I could have borrowed from it—I now have three policies—and they would have continued to grow. I would now have more cash value and death benefit. Finding this out was the first time I said (out loud), I wish I had learned about Bank On Yourself sooner. The second experience is one that probably more people can relate to. I bought a car in 2011 and took out a conventional loan to pay for it. After paying the loan premiums for several months, I had a real aha! moment. I looked at the loan value in my policies and determined I had sufficient value to borrow against one of them to the tune of about $30,000. So I did. I paid off the car loan and then paid off the Bank On Yourself life insurance policy loan as well. But here’s the good part. When you’ve paid off a car loan to a bank, all you have is the car. But when you’ve paid off a Bank On Yourself policy loan, not only do you have the car, but you also have the loan value back in your own policy to use again. It’s actually higher because the policy dividend and the annual policy premiums increase the policy values—the death benefit, the cash value, and the amount available to borrow. It truly is a win-win-win situation. Why didn’t I learn about Bank On Yourself earlier? I am so glad I eventually did. “Oh, by the way, with the help of my advisor, we are plotting future benefits, since I turn 70½ this year. Can you say “tax free retirement”? Bill knows that life insurance policy loans are one of the living benefits of dividend-paying whole life insurance policies. If you would like to learn more about these living benefits, the first thing you need to do is get with a Bank On Yourself Authorized Advisor to see if such a policy makes sense for you. Your advisor will show you how your policy can build a sizeable cash value over a relatively short period of time. This is good because the maximum size of a policy loan is based on the amount of cash value in your policy. You can borrow between 85% and 90% of your cash value. And there are no questions asked. I suggest you let your advisor assist you with your loan request the first time, so you get the details you need about how life insurance policy loans work. Then send the insurance company an email and tell them your policy number and the amount of money you want to borrow. Also, tell them where to deposit the funds or mail the check. That’s it! You should have your money inside of a week—funds typically arrive in three or four days. What if you die while you still owe money on your life insurance policy loan? For example, let’s say you have a dividend-paying whole life insurance policy with a death benefit of $530,000 and a cash value of $200,000. And then you borrow $30,000 to purchase a new car, planning to pay back your loan over six years. You get the money in three days, buy the car, and then what? The worst-case scenario would be if you were to pass away that very afternoon. That would be tragic. But things like that do happen. What would happen to your life insurance policy loan? Your beneficiary would receive a death benefit check of approximately $500,000, rather than $530,000, and the $30,000 loan would be completely paid off. Plus, your beneficiary would also have that brand new car. What if you can’t make the policy loan payments you’d planned to make? With a Bank On Yourself policy loan, you pay off your loan on your schedule. Now, you do pay interest—simple interest—on your loan. At the end of each policy year, any unpaid interest is simply added to your loan balance. So you do want to pay down your loan responsibly. But if you miss a payment or two, nothing much happens. You’ll owe some interest, but, unlike with traditional financing, there are no late fees, no delinquency fees, no black marks on your credit, nor any other bad consequences. And the interest on life insurance policy loans is typically at a below-market, competitive rate. One of the most fascinating aspects of life insurance policy loans from a Bank On Yourself-type dividend-paying whole life insurance policy is that even though you’re putting your cash value up as collateral, your cash value grows just the same as if you hadn’t touched it. Space doesn’t allow me to go into that amazing bit of financial wizardry here. But FAQ #5 in this article explains how your cash value can grow just as if you hadn’t touched a dime of it. Just think about that. Suppose you get a letter from the IRS saying you owe an additional $25,000 in taxes. You weren’t expecting that! But no problem, right? You just take a $25,000 401(k) policy loan to pay the IRS what you owe. But then, your employer has a slump in sales and revenue, and you get laid off. Now you’re unemployed. No income. And perhaps no prospects for a decent job in the foreseeable future. Maybe you could live with that. But now you have this $25,000 loan that must be repaid in two months. If you don’t pay it, the $25,000 will be treated as income to you, thus boosting your income for the year by $25,000. Will that bump you to the next higher tax bracket, so you end up paying more taxes on all your income? So maybe now, in addition to your “regular” income tax, you’ll owe $7,500 in taxes on your 401(k) loan. Plus, you’ll owe 10%—$2,500 dollars—in penalties, unless you’re more than 59½ years old. So the $25,000 has been paid to the IRS, you have no income, and you owe Uncle Sam $10,000 in taxes and penalties just on that one loan. Then, if the market recovers, you lose again because you’re not in it! Bill has been moving his savings out of his tax deferred IRAs and into three Bank On Yourself-type whole life policies incrementally for almost seven years now. Learn the ins and outs of rolling over a 401(k) plan or IRA into a Bank On Yourself plan here. Discover the tax advantages of life insurance here. Bill also met with a Bank On Yourself Authorized Advisor for a free, no-obligation analysis of his situation. You, too, can meet with a Bank On Yourself Authorized Advisor. There’s no cost, no obligation, and no pressure. 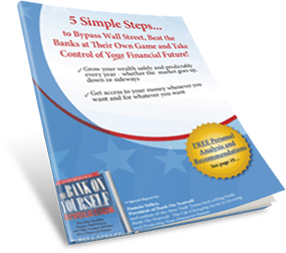 Begin by requesting a free analysis, to discover what a Bank On Yourself plan can do for you. I’ll also see that you get connected with a qualified, specially-trained Advisor who will answer all your questions.